Newly designed head block with high rigidity and stability. New CNC Carbon Fiber frame, improve the rigidity and perfect for 3D flying. Single piece integrated design of main bearing block and servo mount. Single piece integrated design of anti-rotation guide and gyro mount. Highly stable flybar control system. High precision bearing mixing arms. Newly designed high resolution swashplate. Single piece battery mount with integrated canopy mount designed to bring CG closer to disk plane. Highly rigid frame with single piece carbon side and bottom plates. Highly efficient Belt driven tail design. Weighted tail rotor blade grips to repel centripetal forces. Straight-up in-frame rudder servo mount for improved geometry. Newly designed aerodynamic Fiberglass canopy. Newly designed high strength main blade grips. Rigid CNC aluminum rotor head for precision and smooth movements. Tail rotor hub made of stainless steel, very rigid. Great stable and sensitive mixing lever design! Can display the great stability and precision for 3D flight. 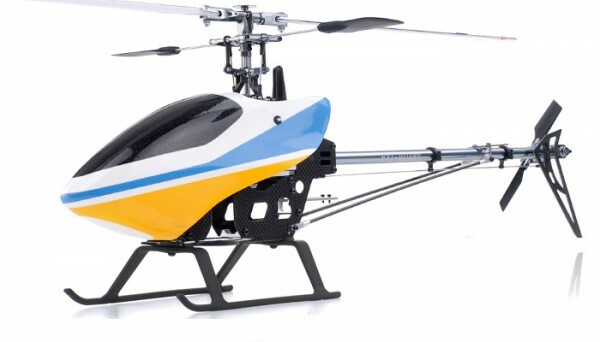 Special adjustable pitch system, hold rotation system, tail rotor Belt driven system! It is a work of great originality for helicopter! Using new CNC Metal Main rotor holder with thrust bearing and 4mm Feathering shaft, features smooth rotation and stability under high rotation speed. Tail rotor control set with dual bearing, features CNC control piece and smooth structure design, get smooth pitch travel. Providing flybar weight- When normal flying, you can add the weights on flybar paddles for stable flight. When aerobatic flying, you don’t need to add the weight, but you can see the flexibility of 3D actions. CNC tail pulley assembly and tail holder are using high rigid aluminum alloy, features wear resistant and falling resistance. Using new high strength ball links and stainless steel linkage balls on the whole unit, feature wear resistance, anti-oxidization.